Where's there is smoke, there is fire. The schizophrenia of the Go Hillsborough debacle continues. Last Wednesday the county commissioners decided Wednesday to audit how Parsons was handed a million dollar blank check via an umbrella miscellaneous engineering contract. The county commission should have voted to shut down or at least suspend Go Hillsborough then. However, County Administrator Mike Merrill, acting in his new role as an unelected County Mayor, stepped in and told them not to. Hmm....Who's in charge? Hillsborough County administrator Mike Merrill has asked Sheriff David Gee to provide a review of the county's Go Hillsborough procurement following a 10 Investigates report that raised questions about the behind-the-scenes influence of a well-connected consultant. Merrill also suspended work on the transportation project's outreach "until a satisfactory resolution can be reached." To be totally independent, FDLE should do the investigation and the investigation should not be done by anyone local or who is funded by the county commissioners. Remember it was County Administrator Mike Merrill who proposed last year after he took over the transportation initiative, that the governing Board of our transit agency, HART, be taken over by all electeds. Can you say PSTA? We asked when the county commission voted in the Sunshine directing Merrill to takeover responsibility for the transportation initiative. His responsibilities changed and Merrill had to hire numerous high level staff to cover his day job while he focused on the transportation initiative. To date, we have not received an answer. A full investigation should go back to March 2013 when the BOCC created the Transportation Policy Leadership Group. We wrote about a circular money trail surrounding Go Hillsborough here. An independent investigation must review any and all communications and documents of anyone associated with the transportation initiative and Go Hillsborough, including emails, cell phone messages, text messages, social media messages, memos. We cannot leave it up to the owner of the cell phone to determine if there were messages involved regarding this entire debacle. That sounds eerily familiar to the Hillary Clinton server scandal. Complaints, questions and public records request began as soon as the County handed Parsons Brinckerhoff the million dollar no bid contract September 5, 2014. Unfortunately, County staff and the electeds refused to take these questions, comments and complaints seriously and address them early on. Now it's a year later and we have this big mess. The intent of the Consultant's Competitive Negotiations Act (CCNA) procurement process, which is how Parsons was awarded the Go Hillsborough campaign work, is for general and civil engineering services, governed under Florida Statute 287.055. (2) DEFINITIONS.—For purposes of this section:(a) “Professional services” means those services within the scope of the practice of architecture, professional engineering, landscape architecture, or registered surveying and mapping, as defined by the laws of the state, or those performed by any architect, professional engineer, landscape architect, or registered surveyor and mapper in connection with his or her professional employment or practice. Where is the precedence of any other county in the state of Florida using a CCNA umbrella "Miscellaneous Engineering Services" contract to procure PR, marketing, electioneering and campaign work to push a sales tax hike referendum? Go Hillsborough was campaign work from the get go. We know Leytham was involved from the start confirmed by her text message dated October 1, 2014 as reported by Pransky's 10 Investigates report to deputy county administrator Lucia Garsys. Why would a PR person be telling the County how to answer questions about the Parsons procurement process that they, the county, used? When did all the county commissioners know Leytham was part of the deal with Parsons? When did County Attorney Chip Fletcher know Leytham was part of the deal with Parsons? When did Mayor Buckhorn know Leytham was part of the deal with Parsons? In October 2014, Beth Leytham politicized this work effort as she began scheduling November focus groups, micro-targeting voters most likely to oppose a sales tax increase. This occurred before Parsons Brinckerhoff ever presented to the Policy Leadership Group at their October meeting. Parsons, of course, did not include in their public presentation that their PR sidekick was already doing electioneering and campaign work with your tax dollars. On Thursday night, Connect Tampa Bay rolled out its vision of what a new transportation system should look like and how to pay for it, details that county commissioners and the county's three mayors are still discussing. The group's plan, called “Go Hillsborough,” advocates a 1 cent sales tax increase that would raise $204 million annually in today's dollars. Leytham has ties to Kevin Thurman, the Executive Director of Connect Tampa Bay, who presented their plan. Thurman is also a political consultant who does not disclose who his clients are. Thurman has been the Tribune's go to person too often on Go Hillsborough. We now know the very cozy relationship Leytham has with the Tribune editorial board of which the Tribune has never disclosed. Thurman has leaked information throughout this initiative including what we posted here in May. It was the county, and either County Administrator Mike Merrill, himself or his staff, who handed poll information to Thurman. We understand Thurman found out about the poll information through Mayor Buckhorn's office. After speaking with Eric Johnson at county center, the Eye found out it wasn't the county who was publicizing the results of their poll today. It wasn't the county who handed the results to Salinero. It wasn't even Salinero of the Tribune asking the county for the poll results. We are told the county had planned to publicize the results at next weeks Transportation Policy Leadership Group meeting. It was Kevin Thurman, a paid lobbyist as Executive Director of the pro transit group Connect Tampa Bay, who requested the poll results from the county. It was Kevin Thurman who handed the results off to Mike Salinero. Since that information was not pointed out in Salinero's article, readers probably thought Salinero got the poll results directly from the county or Transportation Policy Leadership Group. We wonder how the Transportation Policy Leadership Group must feel about a poll they sanctioned being released to the media before they have had a chance to review and comment on the results. A Public Records Request from the county confirmed that Parsons Brinckerhoff provided NO Engineer of Record for the Go Hillsborough work and there are NO signed and sealed engineering documents resulting from their work done for the Go Hillsborough initiative. Statue 287.055 was never intended to enable engineering firms to launder hundreds of thousands of dollars to politically well connected PR firms to do marketing and campaign work to put sales tax hikes on the ballot. Parsons Brinckerhoff's umbrella CCNA contract for "Miscellaneous Engineering Services" was one of numerous engineering firms initially awarded these contracts in June 2012. At a June 2014 BOCC meeting, Parsons CCNA contract was extended for 2 more years, conveniently 2 months before the August 2014 PLG meeting where suddenly they voted to hire a so-called transportation expert for public engagement and specifically stated do NOT hire a PR firm to do it. Interesting timing too, Bob Clifford, resigned as Executive Director of TBARTA last May 2014 and immediately went to work for Parsons Brinckerhoff in June 2014. Clifford sat in the audience at the August PLG meeting where they voted to hire a so-called "transportation expert" to do public engagement. What did he know and when? Find Parsons umbrella CCNA contract here. This is how Parsons got awarded this $1.35 million boondoggle contract without the county commissioners ever having to originally vote on the contract award. Work orders were used against an umbrella contract to simply keep increasing the cost of this effort from less than $500K to a million dollars to now $1.35 Million. Using the CCNA umbrella contract enabled Parsons to immediately subcontract PR and campaign work to Beth Leytham - no transparent bid, no RFP, no requirements. In Noah Pransky's 10 Investigates report interview with Leytham, she admits the Parsons effort is about getting another transportation referendum on the ballot and then the effort gets handed off to a private advocacy campaign or lobbying group that supports it to advocate for it. According to Pransky's report, Leytham texted County Administrator Mike Merrill on August 19, 2014, in what appears to be an effort to steer the public engagement work to her transportation client Parsons Brinckerhoff. We assume she knew that when that occurred she would get her piece of the huge taxpayer funded pie and she would be the real orchestrator of the campaign. June and July 2014 PLG meetings were cancelled. Merrill stated at the May 2014 Policy Leadership Group (PLG) meeting that transit projects would be publicly presented at the June PLG meeting. That NEVER happened and those presentations never occurred. Why? Suddenly when the PLG reconvened in August 2014 the PLG was voting to hire a "transportation expert" to do public engagement - at Merrill's request. What was going on behind the scenes between May and August 2014 that caused the PLG to forego publicly discussing transit projects but all of a sudden voting to hand this effort off to a third party? Leytham would never have sent that text message without her knowing full well that the end result of this so-called public engagement was another sales tax referendum. That was baked in from the start. Go Hillsborough was always a marketing campaign for another huge 30 year tax hike referendum that captures rich voter information and contact information - all at taxpayer expense. 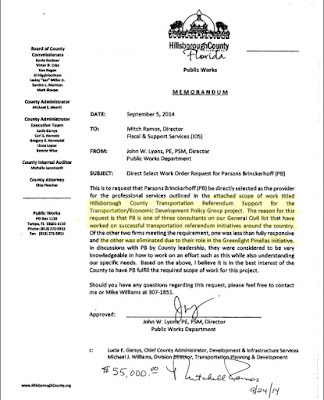 That answers the question why the County awarded a scope of work to Parsons Brinckerhoff titled "Hillsborough County Transportation REFERENDUM Support". It's PR, marketing and campaign work to push another referendum not engineering work. County Administrator Mike Merrill cannot feign ignorance on how this was awarded to Parsons because we know Leytham texted him about it. Who else did Leytham text? That's why for a million taxpayer bucks in June the Parsons/Leytham/Merrill team proposed a huge 30 year tax hike before we ever got a plan. Propose the tax then figure out what it will pay for - sound familiar? Professional engineering work does not include electioneering/campaign work and certainly does not include micro-targeting voters. This campaign has been flawed and very sloppy. It appears there are violations of the CCNA contract itself, perhaps because it was being run by a PR firm not an engineering firm. Why did "they" think they could get away with it? Because they have before? We have posted previously on the Eye about many of these issues. Leytham launched the GoHillsborough.org website (domain owned by ad agency Chappell-Roberts not the County), at taxpayer expense of course, in February without any disclaimers that information provided to or on that website was subject to public records access. She did the same thing with the $1.2 million federal HUD grant the city of Tampa received and steered to Parsons/Letham for InVision Tampa. It took about two weeks after raising the issue with county staff and county commissioners that the disclaimers were finally added to the Go Hillsborough website. Go Hillsborough refused to comply with my Statute 119 Public Records Request for copies of documents related to activities conducted at taxpayer expense until the media, Channel 10's Mike Deeson also requested them as I posted here. Section 10.1 of the CCNA contract states that Parsons (and any subcontractors) must comply with all federal, state and local laws, rules and regulations. That would include our Sunshine laws and complying with public records request from anyone, not just the media. Go Hillsborough displays information making claims without any source or source data citations. Engineers do not do that, PR marketing firms do. Go Hillsborough displays at their meetings pictures of LA traffic insinuating it is Hillsborough County. Engineering firms do not do that, PR marketing firms do. Go Hillsborough was deceptive about the information they provided the public. Section 16.1 of the CCNA contract states that Parsons shall make no statements, press releases or public releases concerning the contract or its subject matter without first notifying the County and securing its prior consent in writing. On August 17, 2015, conveniently on the same day Go Hillsborough started their 2nd round of meetings costing taxpayers $350K, Leytham sent out a Go Hillsborough Press Release stating Go Hillsborough was bringing back the 1% sales tax hike. I requested on September 9 via a Public Records Request a copy of the written consent from the county related to approving this press release. To date I have received no response. Taxpayers are paying hefty Parsons engineering consulting rates but what we got was a marketing and electioneering campaign. This work should NEVER have been procured under the CCNA umbrella professional engineering services procurement process. And taxpayers should be very concerned because taxpayers must be protected from the use of taxpayer monies being used against the taxpayer. Does a CCNA contract that is intended for procuring general and civil engineering services, not campaign work, protect taxpayers? Does an umbrella miscellaneous engineering contract include any contractual/legal protections that prevent Parsons, Leytham or any other subcontractors, ad agency Chappell-Roberts, Jacobs Engineering or anyone else subcontracted, from handing over rich voter information, contact information or other rich information they gathered about or from Go Hillsborough participants, obtained all at taxpayer expense, to anyone? What prevents any of these people from handing over rich information to a private advocacy campaign, another lobbying organization or even a candidate who supports a sales tax referendum placed on the ballot? Does the county have all the information and data taxpayers paid to gather? The Parsons CCNA contract, never intended to be used for broad public engagement, PR and marketing campaign to put a referendum on the ballot, does not appear to protect taxpayers. Time for the County to shut down Go Hillsborough now. Time for the County to receive in writing from Parsons that they or any of their subcontractors or sub-subcontractors (name them all) will NOT hand any information gathered at taxpayer expense to anyone other than the County - who paid for the effort, should own all the data gathered and it should be subject to public records access. Because this Parsons contract is risky business to taxpayers. Go Hillsborough Circling the Wagons?